Compact design, and extreme simplicity: Kubox is the capsule coffee machine ideal for preparing a real, creamy Italian Espresso in your own home. It's ready in seconds and the practical central button lets you choose the quantity of coffee to suit your taste. High-quality coffee, freshly ground to keep its fragrance and a capsule machine designed to enhance its flavour; with these prerequisites Kubox offers a dense and creamy Espresso that embraces the senses. The capsules contain the right amount of coffee, ground to the right consistency for making an excellent espresso. The pre-packed blend does not change in flavour over time and is supplied in a package sealing in the aroma and taste of freshly ground coffee. The large capsule collection drawer lets you collect both used capsules and any drops of coffee. The transparent window on the drawer lets you see how many used capsules are in it at any time. Once full, it can be conveniently divided into two parts: one for the used capsules and one for the drops, thus avoiding getting dirty or dirtying the area the machine is used. Along with the coffee machine you'll find a taster of the four AromaPolti blends designed to satisfy the most demanding and refined palates. AromaPolti coffee is 100% coffee, gluten and sugar-free. 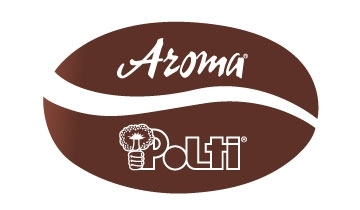 Buy your capsules directly online from the site www.aromapolti.com: five blends for the most demanding, refined palates, Sublime, Crema, Elisir, Premium and Deca. With Kubox you choose the quantity of coffee you want: press the lighted button to stop dispensing when the amount you want has been delivered. Kubox is ready in just a few seconds to dispense an espresso just like the one in the café. The large transparent tank can be easily removed to fill it with water directly from the tap. The lid prevents dust or dirt from getting into the water. Small cup, large cup, mug: thanks to the adjustable, two-position grid you can use your own favourite cup. A kit of 8 assorted capsules, 2 for each of the four Aroma blends: Crema, Elisir, Sublime and Deca.